BlazBlue: Continuum Shift II is an enhanced follow up of the critically acclaimed BlazBlue: Continuum Shift, and the next installment in the popular 2D fighting game series known as BlazBlue. BlazBlue: Continuum Shift II contains the complete set of single player features from the console version, such as Arcade, Score Attack, Training, and Story mode, as well as an ad-hoc Network mode for multiplayer play. This impressive list of features is topped off with new content created solely for the handheld version, including extra story material and brand new modes such as Legion 1.5 and Abyss Mode. All-New Single Player Content – Upgrade your character to reach the bottom in the new Abyss Mode, create an army to conquer your foes in the new Legion 1.5 Mode, polish your skills in the revamped Challenge Mode, and earn Platinum Dollars to unlock a host of in-game rewards. 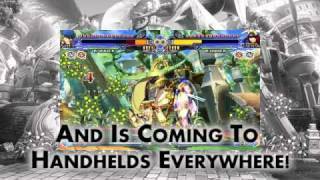 Redesigned Fighting Experience – With new system mechanics, game engine revisions, and an entirely rebalanced roster from its original predecessor, BlazBlue: Continuum Shift II offers a fully updated fighting game experience for both veterans and newcomers alike. Enhanced Story Features – BlazBlue: Continuum Shift II contains not only the full story of the original, but also brand new Story Mode and Arcade Mode segments for players to enjoy. Ad-hoc Multiplayer – Ad-hoc multiplayer allows up to 4 players to participate in a single session. Two players will square off while the others are spectators.